These three main purposes were outlined in our interpretation strategy. At the time of writing that strategy we had no time to do a full search of the literature for any precedent on the theory of the use of film in exhibitions. However, it is something I have an ongoing interest in, so if you know of any discussions of this, please use the comments field below this article to highlight any references or links. 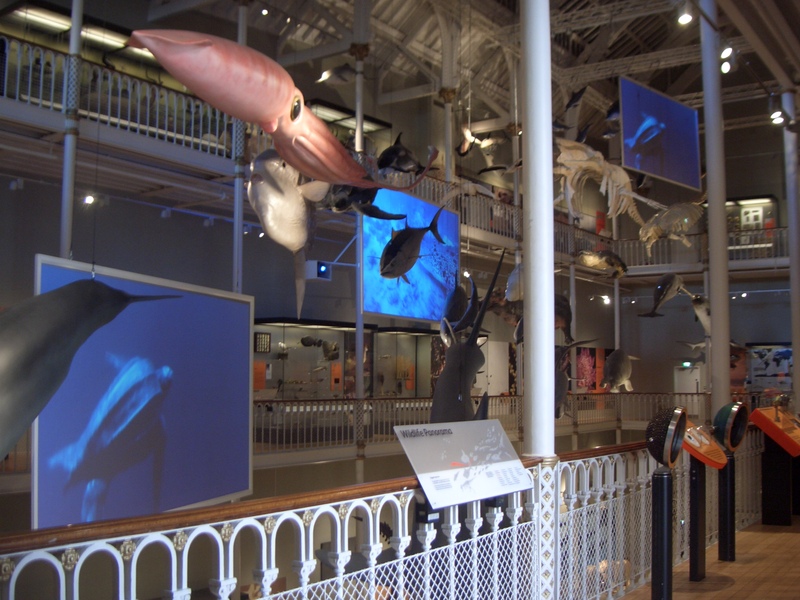 In the Natural World galleries, we have three large-scale presentations. 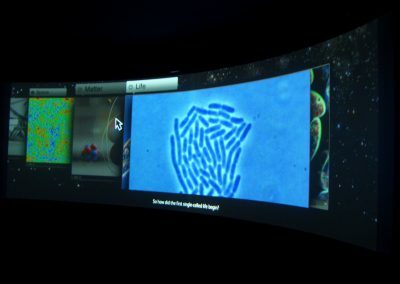 Animals in Action is a huge three-screen presentation that hangs among the animals in the Wildlife Panorama. 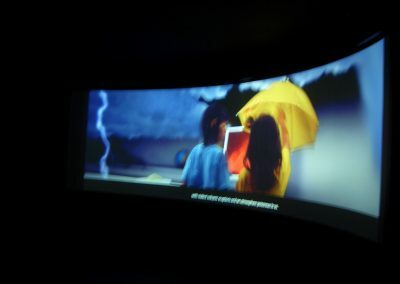 And Earth Events is a large-screen film in the Restless Earth gallery. 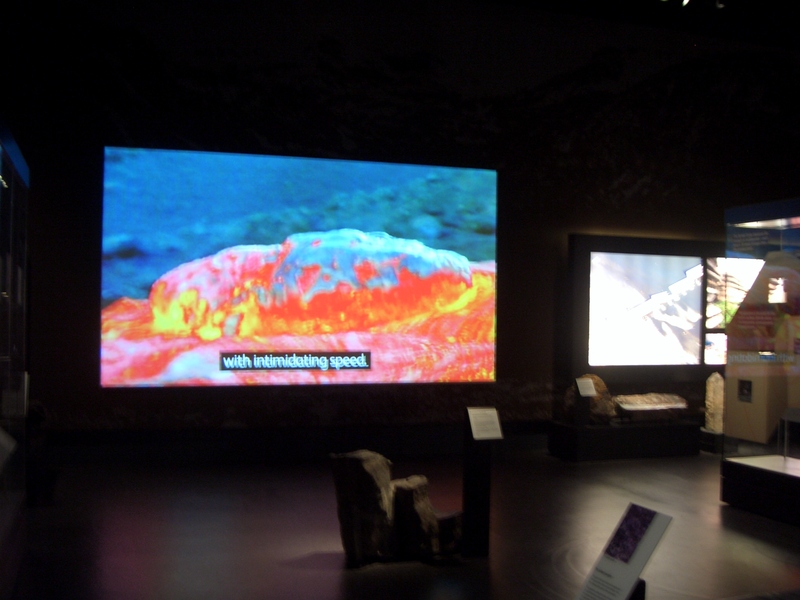 Both of these films aim to give a context for the displayed objects, whether that’s animals or geology specimens. Universe Odyssey is the only film we have that has a sit-down theatre. This film uses live-action, CGI and library footage to tell the story of the history of the universe from the big bang to the origins of life on earth. It introduces the narrative thread that holds the Earth in Space gallery together and links the sections of that gallery – matter, space and life. In the World Cultures galleries, some of the films are providing context for the objects on display as in the Natural Science galleries. 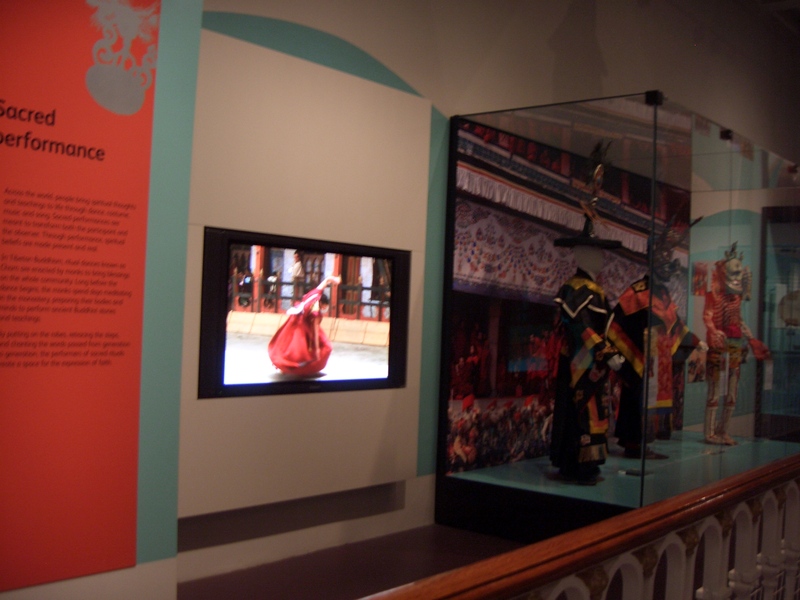 For example, there are films showing weddings and markets from around the world in the Patterns of Life gallery and there are films showing both Cham dancing and African masked performance next to the related displays in the Performance and Lives gallery. 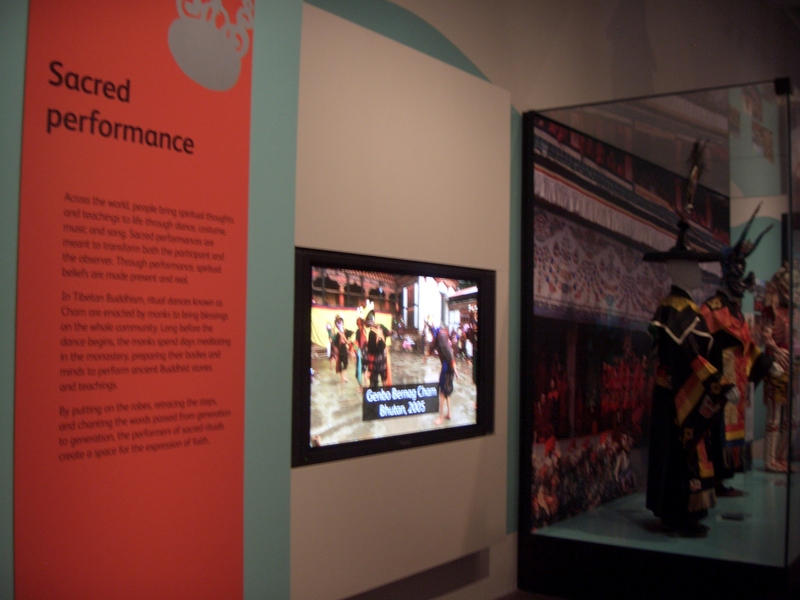 Some of our films, however, go deeper into the stories of the people involved in the displays. 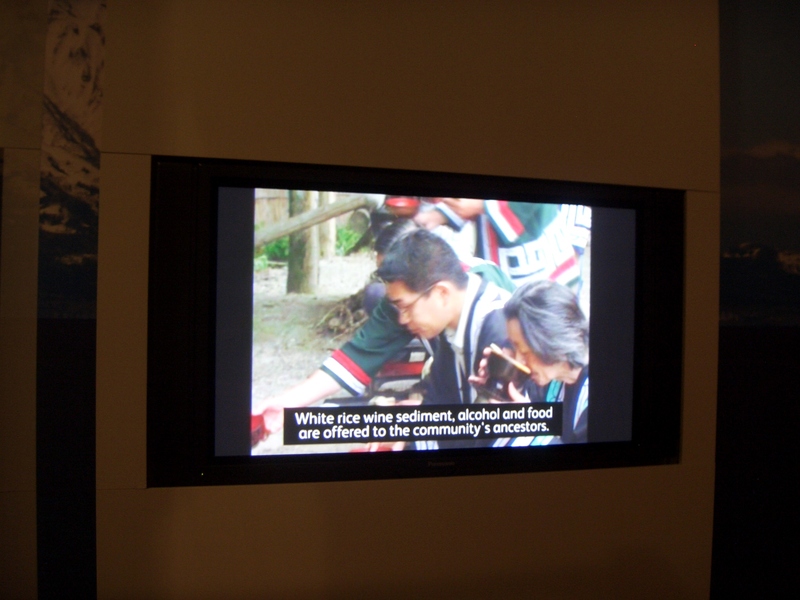 For example, in the Living Lands gallery we have four films which all relate to contemporary communities living traditional ways of life. We felt that this was important to show because although we do have some fantastic contemporary objects, the majority of our collections are historic. Living Lands starts with an introductory film. This shows four 2-3 minute clips taken from longer documentaries. Each represents a group of people featured in the gallery – the Inuit, Tibetan nomads, Australian aboriginal people and the Kwakwaka’wakw people of the north pacific coast of North America. This film allows these four peoples to talk in their own words about the challenges of keeping traditional ways of living within their specific landscape alive for their children. We feel this film summarises the messages of the gallery and hope that this introduction gives a context to help visitors relate to the objects on display. In the Arctic section of the Living Lands gallery, we wanted to tell the story of a project which we have been involved with since 2002. Many of the objects in our collection from the arctic region came from trades between Tlicho people of northern Canada and Scottish people working for the Hudson’s Bay Trading Company in the 1850s. 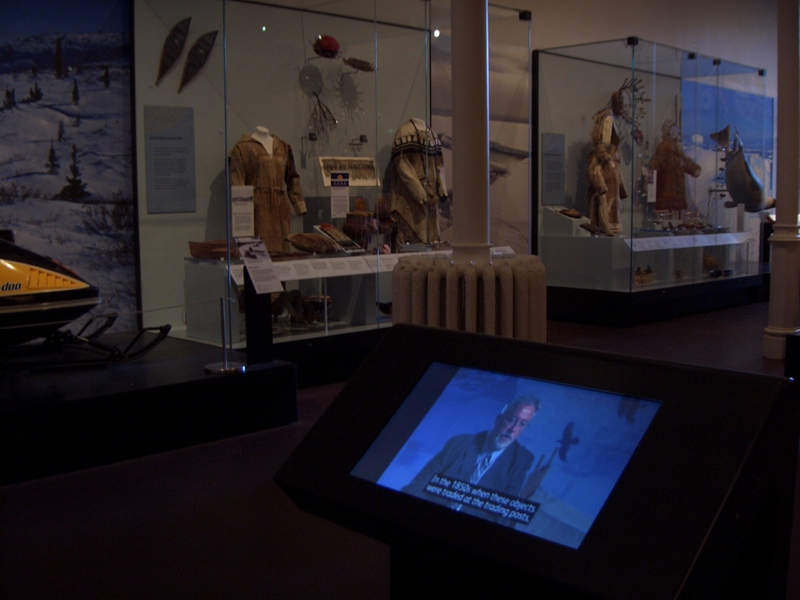 In partnership with the Tlicho Nation and the Prince of Wales Northern Heritage Centre in Yellowknife, National Museums Scotland organised reciprocal visits between Canada and Scotland and exhibitions in both countries. Objects were taken to Canada and used to facilitate story telling between elders and children about the past. 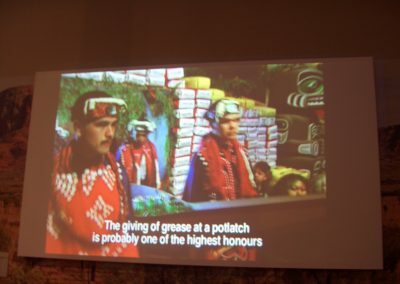 This film tells visitors to our gallery today about this project and is narrated by John B Zoe of the Tlicho Nation and John Andrews of the Prince of Wales Northern Heritage Centre, who we filmed when they attended the opening of the exhibition Extremes here in Edinburgh in 2007. 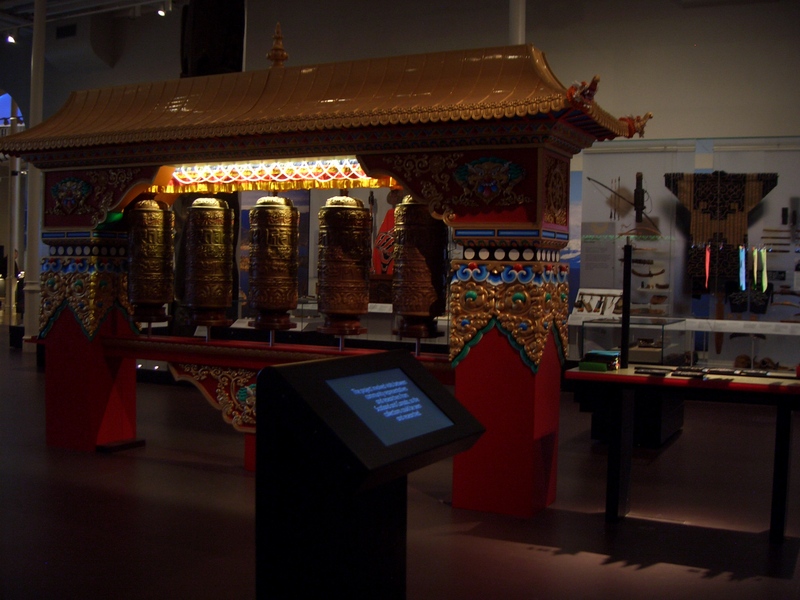 One of the most ambitious new acquisitions in the World Cultures galleries was the commissioning of a set of fully functional and entirely authentic prayer wheels which visitors can interact with. The story of how these prayer wheels were made, who made them, what goes inside them, and what they mean to Tibetan Buddhists is told in the film that sits alongside the wheels in the gallery. Once the prayer wheels are complete, you cannot see inside them. It is only by filming the process that we can show visitors that each wheel is filled with rolls and rolls of paper on which tiny mantras are printed thousands of times, and blessed. 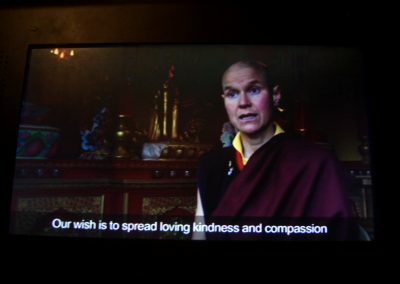 it’s also an opportunity to tell people about the buddhist monastery Samye Ling in the Scottish borders who made the wheels for us. 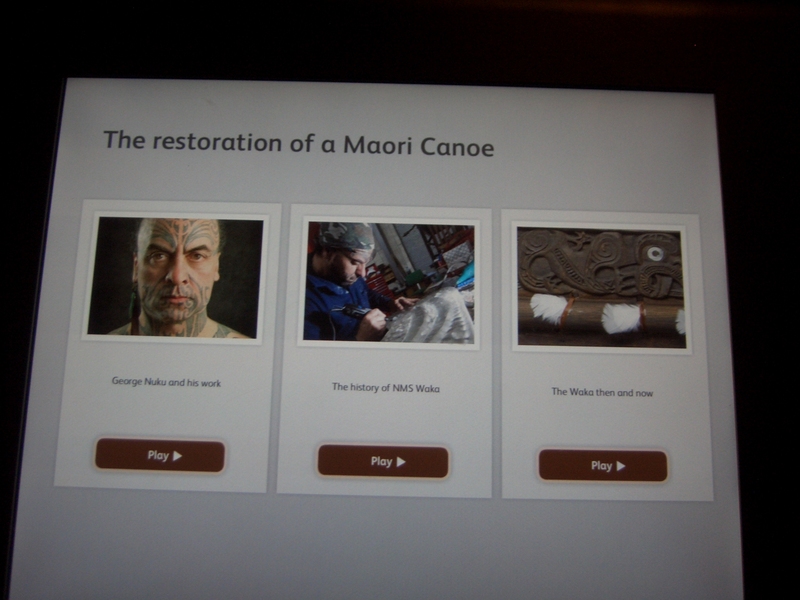 Another ambitious collections project we undertook during the development of the new galleries, was the complete refurbishment of a Maori war canoe or ‘Waka’. You can read about the project here. A Maori artist, George Nuku, came to the museum and worked with our conservators to research, disassemble and reassemble the object with additions carved in perspex by George. 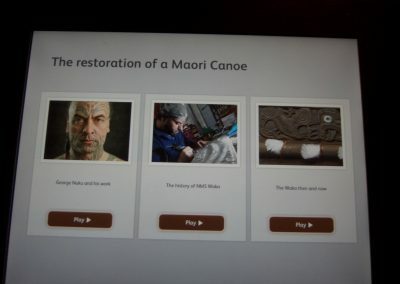 The project gained a lot of publicity at the time in 2008/9 but visitors seeing the canoe for the first time now or in five or ten years time will not know the story. 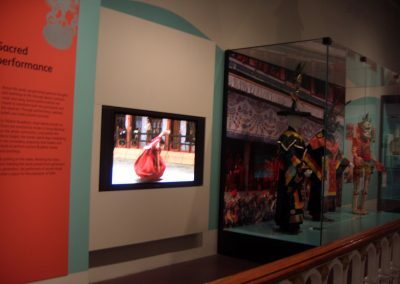 This is why it was very important for us to film the entire process and beside the object we offer visitors a choice of three film clips to watch. 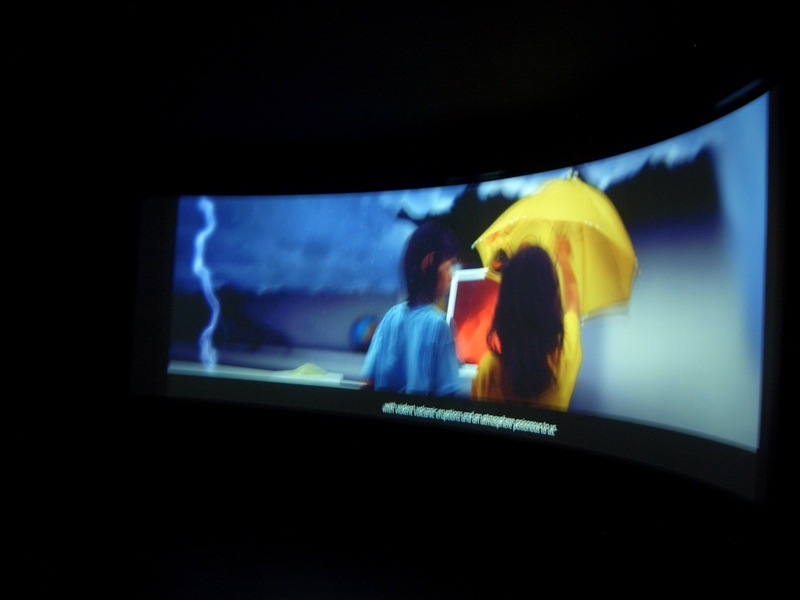 If you have visited any of the new galleries, I would be very interested to hear your opinions about any of the films you noticed or did not notice.